Have you ever felt like you can’t break through in your music career, because you lack the proper equipment, or don’t have professional studio to record & mix in? Maybe you didn’t attend an audio school, or you’re living in a small town, which makes it hard to form connections in the music scene. I feel your pain! Coming up, I had neither of these things going for me. Pretty much the ONLY thing I had was my passion for music. And I just knew in my heart that I was meant to do this. I’m sure you do, too! So, I immersed myself in all aspects of music: from performing, to songwriting, recording and mixing. Basically, I did what every music producer does in the modern music industry. It wasn’t always an easy journey, but I eventally made my way! Today, I’m blessed to have worked with many of my childhood heros, from legenary producers like Jack Douglas (John Lennon, Alice Cooper, Cheap Trick) and Shelly Yakus (U2, B.B. King), to platinum-selling artists such as Aerosmith, The Fray and Rick Springfield. These are the kind of things I could only dream of as a kid! Now, why am I telling you all of this? I want to inspire you and tell you: Keep pursuing your dreams. I could do it, so can you! We’re breaking down the barriers between the professional music industry and homestudio recordists and show you what it takes to make music for a living. With your amazing support, we’ve built a community, where pros and hobbyists get together and help each other to take their music to the next level. I couldn’t be more proud to be a part of this and I want to thank you from the bottom of my heart for your wonderful contributions. – I couldn’t do this without YOU! That’s why I’ve prepared a special gift for you today! Sit in on a mixing session with me and see how I mix a Pop/Rock song from start to finish. Craft a massive drum sound from live drums recorded in a small home studio. Shape lead vocals to sit well in the mix and sounds spacious, yet intimate. PLUS you get to download all the multitracks, so you can mix this song yourself and use it on your resumé to attract new artists to your studio. Does that sound exciting? I hope so! But enough of the rambling… let’s dive right in! Here is a full breakdown of the techniques I used to mix The Workday Release – Stay. 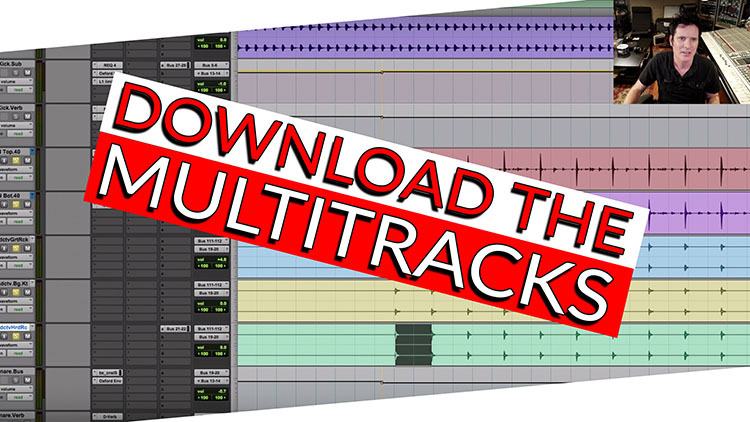 Don’t forget to download the multitracks and mix this song for yourself! Want to watch me mix this song in real time and see how I make decisions on the fly? Check out the next 3 videos and follow my workflow live – step by step. Add energy and excitement to the drums: Parallel Bus Compression, Gating, Reverb and more. Crafting an analogue vs. modern drum sound. Bonus: Can you achieve professional recordings on an inexpensive homestudio setup? We recorded this whole song on an affordable homestudio setup – in a tiny room! After all, how would it look if I preach that you can make great music using inexpensive equipment and don’t do it myself!? This song is proof that you can! We used a $269 Lewitt 440 Pure microphone on David’s vocals, going into an Audient ID14 Interface + ASP800 Preamp. For drums, we ended up using the Lewitt Beat Kit 7 Pro, which will only set you back $1100 for all 7 microphones. We also tracked all electric guitars using IK Multimedias Amplitube 4 Amp Simulator. So all the electrics you’re hearing are created purely in-the-box – from a DI straight into Protools. No amps, no mics, nothing! Check out the following two videos to see how we recorded Vocals and Electric Guitars.